Oh, my. Look at that! It is a set of amazing Brookpark Melmac mixing bowls. 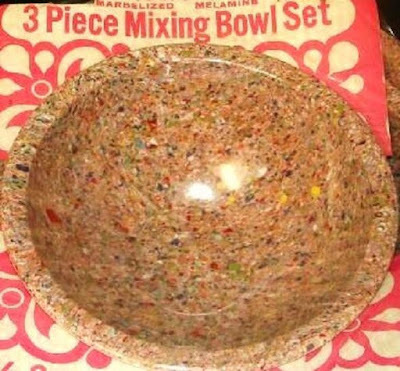 Confetti mixing bowls. Never removed from package. Looking for a new home on eBay. It simply does not get any better than that! I love finding vintage kitchen goodness still in their original packages. 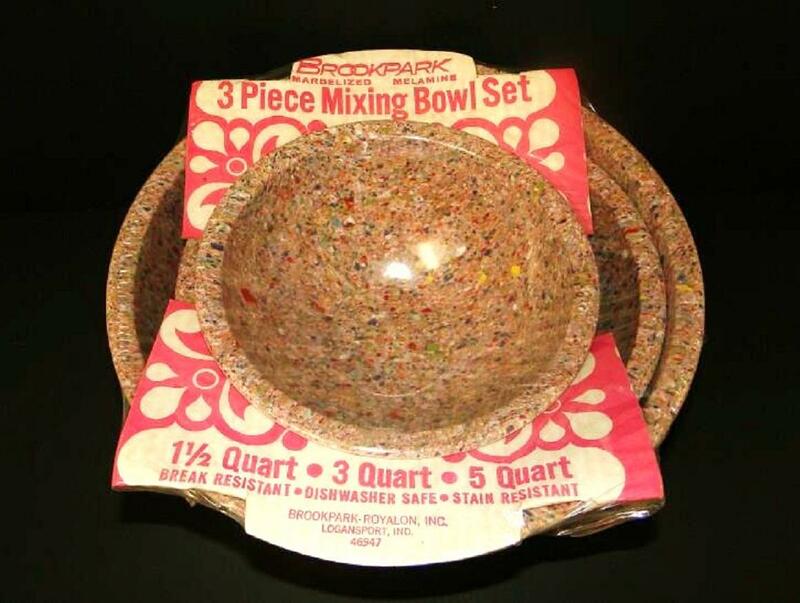 And this set of confetti bowls are perfection. I attempt to keep up with the vintage magazine advertisements on eBay. Hoping to come across one for these bowls. I have gather all kinds of Melmac ad's for their table wares. But have not come up with any for their kitchen wares. Maybe they did not consider doing advertisements for the mixing bowls? What a missed opportunity! With all the colors that were produced for the mixing bowls. I would love to have a look at what colors were produced. These brown bowls with the multi-color speckles seem to have been very popular. Makes me wonder if these were the first ones issued. Maybe they turned into a money making line for Brookpark. And that is what provoked so many other colors being issued. image from here.... and looking for a brand new home! 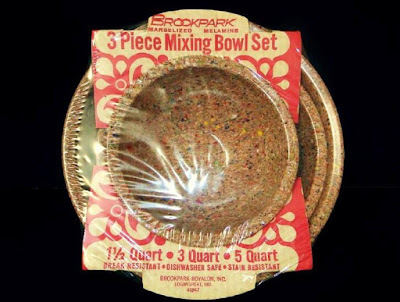 But being able to see a brand new set of Brookpark Melmac mixing bowls... in their original packaging... is amazing. I hope they find a new home! 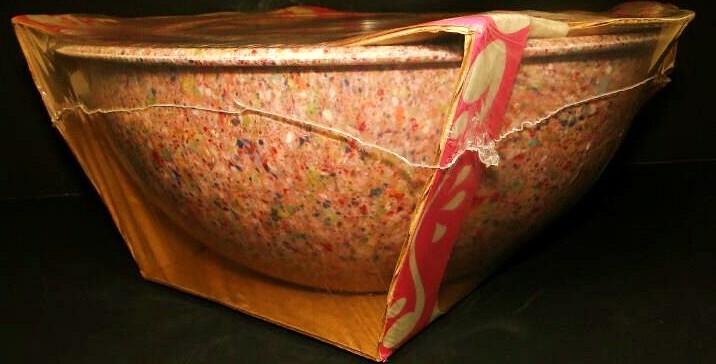 I have such mixed feelings about vintage kitchen items in their original packaging. One one hand, I love the old advertising on the packaging. But on the other, since I use about 99% of my collection, it would be really hard for me not to remove it from the packaging. I had to make a point, not to buy anything more for the kitchen, that does not serve a purpose for daily use. If I add anything new... I have to flush something out of the cabinets to make it fit.